With the current EU laws on Waste going to landfill, along side UK Packaging & Recycling Laws and landfill directives, the waste collection and processing industry must remove as much packaging and recyclable material to cut cost on ever increasing landfill levies. 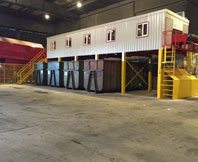 We here at Kenny & Co Engineering understand the needs of the waste industry, and we have been developing through our team of engineers, sorting systems that will give our clients maximum recovery on recyclables. 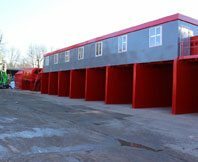 The respective responsibilities of Kenny & Co Engineering engineers to our clients and to environmental laws and directives allow us to design, engineer and fit exact systems within four weeks, so reducing any cost due to down time on works being carried out. Kenny & Co Engineering mingled waste feed stocks. Our complete sorting lines can sort and process all the collected items for further processing. A Kenny & Co Engineering picking station consists of a receiving hopper, finger screen or vibration plate, supply conveyor, bag remover, sorting conveyor, magnetic and eddy current separators. 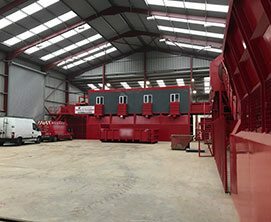 If your waste stream requires further processing, we can design and fit equipment to sort glass bottles using Kenny & Co. Glass shredders and steel/aluminium cans and PET containers can be feed into Kenny & Co Engineering Balers and compacted to reduce their volume. Each piece of equipment is integrated into the system and safety measures are fully implemented. The safety of the operators’ work environment is ensured by installing a dust collector and deodorizer and the surrounding environment is also protected by providing secondary pollution prevention measures. Collected household waste in refuse bags can be feed unopened into the receiving hoppers, where the finger screens or vibrating plates will open up the waste for processing further into the sorting system. The continuous line of sorting equipment, picking stations, crushing and compacting equipment operate continuously. 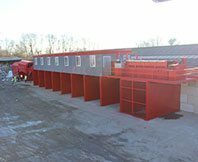 Automatic sorting and manual sorting can be used parallel to each other, it depends on your main waste streams, and co-mingled feed stocks. What ever your needs are, Kenny & Co Engineering engineers can provide you with the machinery.